Music, art, and outdoor festivals provide an excellent source of entertainment for campers and often have on-site camping grounds or nearby camping. 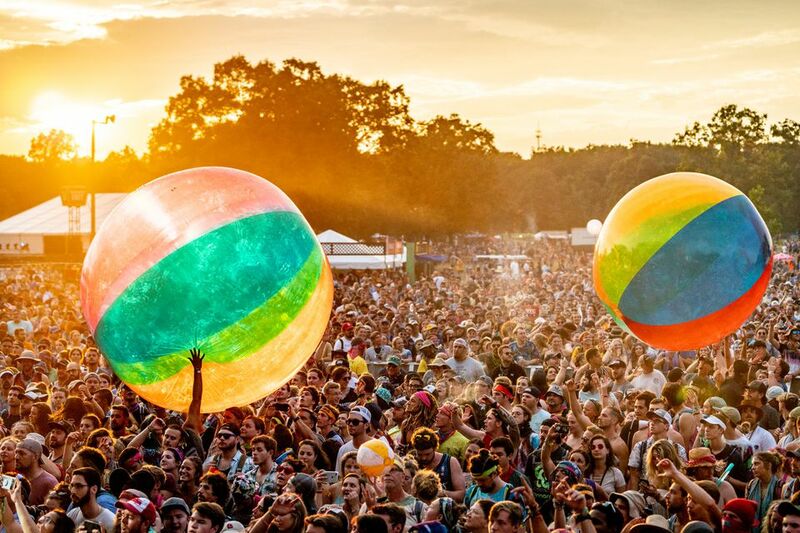 This is your state-by-state guide to some of the best outdoor concerts and music and art festivals that include camping. Talkeetna Bluegrass Festival (Talkeetna): Alaska's greatest camp-out festival is a celebration of music and the outdoors with four days of bluegrass music and outdoor fun. Grand Canyon Music Festival (Grand Canyon National Park): Some of the nation's finest chamber musicians in concert in one of our nation’s favorite national parks. The Grand Canyon Music Festival takes place each year in August and September. Hobby, Craft and Gem Show (Quartzsite): It all happens under the big top and runs concurrently with the Rock and Roll Classic Car Show. Rock and Roll Classic Car Show (Quartzsite): This is an annual event and runs concurrently with the Hobby, Craft, and Gem Show. The Quartzsite Sports, Vacation and RV Show (Quartzsite): Every January it’s "the largest gathering of RVs and RVers anywhere in the world!" In conjunction with the rock, gem and mineral show the There are 20,000 campsites. Mt. Magazine International Butterfly Festival (Paris): Over 90 species of butterflies are viewable at Mt. Magazine, Arkansas' newest state park. Additional camping is available at nearby Mount Nebo and Petit Jean state parks. Calaveras County Fair and Jumping Frog Jubilee (Angel Camp): Jumping frog contests aren't the only fun they have at the annual Calaveras County Fair presented by the District Agriculture Association. California World Music Festival (Nevada City and Grass Valley): A family event that explores the diverse cultures and music of our world." The annual event takes place every year in July at the Nevada County Fairgrounds. High Sierra Music Festival (Quincy): One of California’s most popular four days of music, children's programs, vendors, and food at the Sierra County Fairgrounds each year the first week of July. Huck Finn's Jubilee (Ontario): This annual mid-June weekend event offers a Catfishin' Derby, Russell Bros. Circus, over 30 hours of bluegrass and acoustic music, hay rides, fence painting contests, Injun Joe's Treasure Hunt, and much more. At Mojave Narrows Regional Park. Kate Wolf Memorial Music Festival (Black Oak Ranch, Laytonville): This weekend event celebrates the music of Kate Wolf. Live Oak Music Festival (Santa Barbara): A three-day concert and camping event held at Live Oak Camping the Central Coast foothills. Mammoth Festival of Beers and Bluesapalooza (Mammoth Lakes): Two days of craft beer tasting from more than 100 micro-breweries from around the country with blues music in the beautiful Eastern Sierra. This popular festival takes place each year in early August. Parkfield Bluegrass Festival (Parkfield): Bluegrass music, workshops, food, crafts, and nightly campfire jams. Strawberry Music Festival (Nevada County Fairgrounds, Grass Valley; Westside Park, Tuolumne): "An opportunity for the whole family to participate in a wide spectrum of activities." With spring and fall festival weekends Strawberry is a classic festival for music, family, and fun. Temecula Valley Balloon and Wine Festival (Temecula): Included at this festival are top name entertainment, hot air balloons and tethered balloon rides, wine garden, food booths, arts and crafts, and kid's activities at Lake Skinner Recreation Area. Country Jam USA (Grand Junction): There is spectacular scenery and campgrounds at this popular annual mid-June country music event. Telluride Blues and Brews Festival (Telluride): Three days in a beautiful Colorado Rockies mountain setting, with blues bands, microbreweries, great food, and crafts. Strawberry Park Bluegrass Festival (Preston): A weekend filled with music and family fun at Strawberry Park Resort Campground. Heartland Bluegrass Family Gathering (Arcadia): This bluegrass celebration takes place the fourth weekend of every month and offers free rough camping with a weekend pass at Craig's RV Park. Florida Old Time Music Championships (Brooksville): Since 1982, the FOTMC was established to preserve and promote traditional old-time music in Florida. Bring the family and RV or tent camp for this weekend of music and outdoor family fun at the Sertoma Youth Ranch. Gamble Rogers Folk Festival (Elkton): Folk concerts, workshops, dancing, jamming, food, folk arts and crafts at the St. Johns County Fairgrounds. Suwannee Springfest (Live Oak): Camp along the Suwannee River for this weekend event held at the Suwannee Music Park. Will McLean Music Festival (Brooksville): Celebrate the father of Florida folk at the annual spring Will McLean Music Festival at Sertoma Youth Ranch. Atlanta Fest (Six Flags Over): The annual mid-June Christian music festival in Atlanta. Chiaha Harvest Fair (Rome): This art festival with music and food is held each year in Ridge Ferry Park. Fairburn Fall Festival (Fairburn): A great musical lineup, artists, and vendors highlight this festival near Atlanta. Yellow Pine Harp Fest (Yellow Pine): One of the world’s biggest annual harmonica festivals located in the sleepy Yellow Pine, Idaho – population 35. Bean Blossom Blues Fest (Nashville): Enjoy Mississippi Delta blues by living blues legends. The jams around campfires at night are the real treat at this festival. Blueberry Festival (Plymouth): Celebrate 50 years od the Blueberry Festival in 2016. The long-standing weekend of music, food, and fun takes place each year in early September at Centennial Park. Limited camping is available at the park. Covered Bridge Bluegrass Festival (Mansfield): Family fun and festivities all weekend in historic Mansfield Village. Camping is available at Pastime Park. Indiana Fiddlers' Gathering (Battle Ground): This festival features the best in old-time and swing fiddle music, plus a free square dance and gospel sing. Primitive tent camping is available inside the grounds at Tippecanoe Battlefield Park. Iowa State Fair (Des Moines): Over 1,800 campsites are available in a scenic wooded setting at the State Fair Campgrounds. Pickin' on the Plains (Colby): This bluegrass and folk festival offers music, food, cowboy poetry, crafts, and family fun. Walnut Valley Festival (Winfield): Camp in the pecan grove and listen to all night jams, as well as four days of great acoustic music, stage performances, contests, and fun each year in mid-September. Big Bone Lick Salt Festival (Big Bone Lick State Park): A heritage event with arts and crafts demonstrations, food, music, and pioneer reenactments at Big Bone Lick State Park, Kentucky. Glasgow Highland Games (Glasgow): A Scottish heritage event with sporting competitions, band competitions, dancing and piping competitions, as well as the clan tents and genealogy classes. This annual event takes place the first weekend after Memorial Day at Barren River Lake State Park. River of Music Party – ROMP Fest (Owensboro): The annual River Of Music Party features over 40 bands for four days of music at Yellow Creek Park. Louisiana Shrimp and Petroleum Festival (Morgan City): In the heart of Cajun country, this festival is "the best the country has to offer." Louisiana State Fiddler's Championship (Natchitoches): This annual competition promotes interest in Louisiana music traditions. Held at the Magale Recital Hall on Northwestern State University campus. Blistered Fingers (Litchfield): These annual family bluegrass music festivals featuring local and national musicians are held at Silver Spur Riding Club in June and August. Weekend tickets include rough camping; some electric hookups are available. Maine Highland Games and Scottish Festival (Brunswick): A fun-filled day of games to promote Scottish culture held at Thomas Point Beach. Ossipee Valley Music Festival (Cornish): This roots music festival in the White Mountains features workshops, craft vendors, dancing, lots of great music, and camping in the pines. Thomas Point Beach Bluegrass Festival (Brunswick): This annual festival celebrates bluegrass music where it meets the sea. Enjoy camping at the park’s quiet wooded sites. Northeast Squeeze-in Festival (Washington): Yes, we're talking squeeze boxes here. This festival highlights accordion concerts, workshops, and more. No one is paid, just having a lot of fun. Curwood Festival (Owosso): A fun-packed, family-oriented festival held "in honor of James Oliver Curwood (1878-1927), who wrote 33 popular adventure novels and who built Curwood Castle in his hometown." Hiawatha Traditional Music Festival (Tourist Park, Marquette): This festival offers traditional music, dancing, crafts, food, workshops, and family activities. Weekend ticket holders camp free. Michigan Womyn's Music Festival (Walhalla): Held in a beautiful and remote forest, Michfest is a full-on celebration of female art and culture filled music, words, dance, workshops, crafts, pageantry, and play. Midland Dulcimer Festival (Midland): This antique auto/hammered dulcimer/folk music festival features stage shows, workshops, craft show, flea market, and antique car show. Sleeping Bear Dunegrass and Blues Festival (Empire): This all-day family affair offers music, dancing, arts and crafts, food, and kids activities. Camp across the road at the Sleeping Bear Dunes National Lakeshore campground. Winstock Country Music and Camping Festival (Winsted): A premier outdoor country music event, with proceeds going to help the education of local students. Hardtimes Bluegrass Festival (Hamilton): An old-timey mountain bluegrass festival is affordable and family-friendly. Rockin' the Rivers (Three Forks): Montana’s premier three-day music festival with on-site camping. Treat your senses to some "great music, wonderful scenery, and the spectacular night stars" at The Bridge. Nebraska State Fair (Lincoln): You'll find plenty of campsites at the Nebraska state fair campground. This fair has music, food, vendors, and all kinds of entertainment for the entire family. Delaware Valley Bluegrass Festival (Woodstown): You'll find as much music in the campground as you will on the stage at Salem County Fair Grounds. This three-day festival of bluegrass music is a family-friendly event and takes place each year on Labor Day Weekend. Falcon Ridge Folk Festival (Hillsdale): This three-day community festival celebrates of folk music and dance each year in early August at the Long Hill Farm. Finger Lakes Grassroots Festival (Trumansburg): The Finger Lakes festival is four days and four nights, with four stages, and over 40 bands, including diverse music from around the world, plus arts and crafts, and special performances for kids. Old Songs Festival (Altamont): There is a lot to do at this festival, including a children's activity area with music, magic, and jesting. Turtle Hill Folk Festival (Honeoye): Three days of music, dancing, food, crafts, kids activities, campfire jams, and free camping at Markus Park. Bass Mountain Boogie (Snow Camp): A family music festival with free camping, arts and crafts, storytelling, wagon rides, and more each year in early May at the Bass Mountain Music Park. Grandfather Mountain Highland Games (Linville): Join in the celebration of Scottish dance, music and outdoor games at MacRae Meadows, just outside the Grandfather Mountain. Lake Eden Arts Festival (Black Mountain); Two weekends of music, dancing, crafts, poetry, workshops, and outdoor activities including swimming, hiking, canoeing and more, plus camping at Camp Rockmont. MerleFest (Wilkesboro): MerleFest is an annual celebration of Americana music and southern gentility held in honor of the memory of Eddy Merle Watson and traditional plus music. Singing on the Mountain (Linville): A day filled with Gospel singing. This is a free event and free camping is available on a first come basis at MacRae Meadows, just outside the Grandfather Mountain. Fargo Blues Festival (Fargo): Blues and refreshment booths at Newman Outdoor Field with on-site camping available for tents and RVs. Mohican Bluegrass Festival (Loudonville): Situated on the Mohican River the bluegrass music festival offers on-site camping at the Mohican Wilderness Campground. Musicians Against Childhood Cancer Music Festival (Columbus): This benefit concert features some great talent and you can camp on the festival grounds at Hoover Y-Park. Prairie Peddler Old West Festival (Butler): Quality crafts, outdoor cooking, old west reenactments, and lots of family fun at this Old West fest. Camp at the nearby Mohican State Park. Oklahoma International Bluegrass Festival (Guthrie): A great lineup of bluegrass music with kids activities, and workshops. On-site camping is available on 50-shady acres. Woody Guthrie Folk Festival (Okemah): This festival is held at the "Pastures of Plenty" Amphitheatre and features many folk legends and offers lots of family fun. Rustic camping is available at Okemah Round-Up Club Arena, near the festival site. Oregon Jamboree (Sweet Home): The annual country music and camping event includes two stages and 22 shows in one weekend. Gettysburg Bluegrass Festival (Gettysburg): Music by top bluegrass artists highlight this semi-annual family event in May and August with RV and tent camping on location at Granite Hill Campground. Philadelphia Folk Festival (Schwenksville): A three-day extravaganza of traditional and contemporary folk music, dance, crafts, camping and campfire sings, storytelling, juggling, and special children's activities at the Old Pool Farm. Spring Gulch Folk Festival (New Holland): This annual family festival in Pennsylvania Dutch Country offers great music, sing-a-long campfires, workshops, dancing, and crafts. Campers also enjoy all the amenities of Spring Gulch Resort Campground. Moonshiner's Reunion (Campobello): Enjoy the tradition of moonshining, with this festival of music, storytelling, and food. The Moonshiners Reunion “is one of the Appalachian region’s most authentic annual folk music celebrations.” Highlights include all-night jams around the campfires at the Woodstick Farm. Plum Hollow Alternative Bluegrass Festival (Campobello): Always the last weekend in May each year, this weekend of outdoor music is “dedicated to the innovations made by creative artists breaking new ground with old music.” Camping is available on the premises at the Woodstick Farm. Blackhills Bluegrass Festival (Rapid City): This music event takes place the last weekend in June at Mystery Mountain Resort. Christmas in the Smokies Bluegrass Festival (Pigeon Forge): A winter and Christmas celebration of bluegrass music at the Smoky Mountain Convention Center. Bonnaroo (Manchester): A four-day camping and music festival held on a 700-acre farm. Tickets include camping. Dumplin Valley Bluegrass Festival (Kodak): A family event with great music, food, and crafts on the Dumplin Valley Farm. Kerrville Folk Festival (Kerrville): This event attracts hundreds of songwriters and musicians. Nighttime music around the campfires is a highlight of this event at Quiet Valley Ranch. Old Settler's Music Festival (Driftwood): This four-day music festival features the greatest performers of Americana roots music at Salt Lick Pavillion and Camp Ben McCulloch. Festival of the American West (Logan): "Experience the sights, sounds, and smells of the Old West as it comes back to life at a truly authentic Western Heritage Celebration." Basin Bluegrass Festival (Brandon): There is lots of music, entertainment, food, and campground picking at this annual bluegrass festival that takes place in early July each year. Graves Mountain Bluegrass Festival (Syria): Three days of great bluegrass, folk and Americana music, outdoor recreation, and family fun located in the Heart of Virginia's Blue Ridge Mountains. Maury River Fiddler's Convention (Buena Vista): Enjoy old-time and bluegrass music, square dancing, and folk singing while camping in the foothills of the Blue Ridge Parkway at Glen Maury Park. Washington State International Kite Festival (Long Beach): There are lots of kite flying events scheduled for this festival on the beach and there's plenty of campsites available. Winthrop Rhythm and Blues Festival (Winthrop): Camp along the Methow River while enjoying the longest running blues festival at the Blues Ranch. Appalachian String Band Music Festival (Clifftop): Five days of music, contests, workshops, square dances, and camping at Camp Washington-Carver mountain retreat. Chippewa Valley Rock Fest (Cadott): This annual July music festival includes four days of rock with campgrounds adjacent to the concert area. Country Fest (Cadott): Featuring an all-star country music lineup, the annual festival takes place each year in mid-June. Campgrounds are adjacent to the concert area. Hodag Country Festival (Rhinelander): You'll find all the big name country western music stars at this annual event held in early July. Porterfield Country Music Festival (Marinette): Northeastern Wisconsin's annual country music event feature an all-star lineup of Nashville recording artists. Cheyenne Frontier Days (Cheyenne): America's premier Western family celebration is a ten-day wingding of street dances, parades, carnival rides, top-name entertainers, free pancake breakfasts, cowboys, Indians, and horses. You're Invited to the National Park Service's 100th Birthday Party, Wahoo!